Well, my post from the other day spurred lots of questions about my sister’s tipi, so I thought I’d share more pics, explain a bit more, maybe help you understand some things! 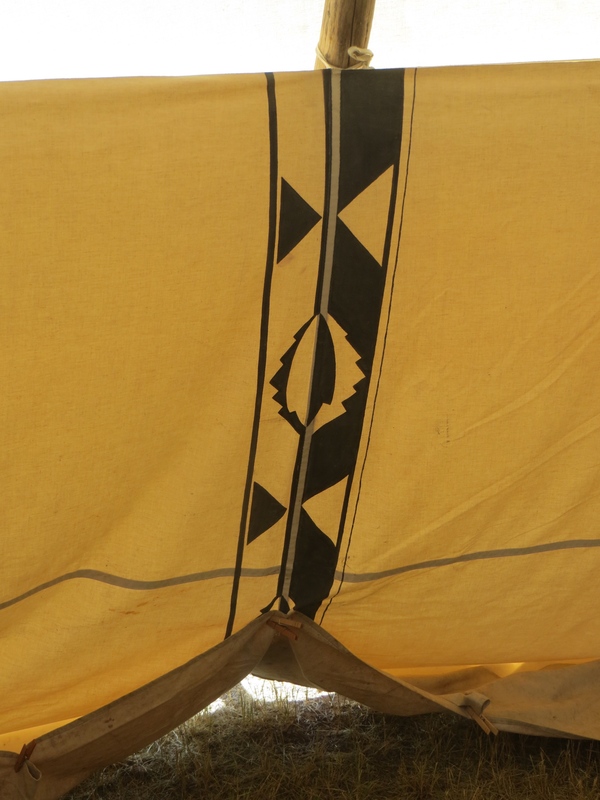 First of all, there’s the Way Back Machine and my post about my sad little wrinkly tipi from clear back in 2008!!!! Holy moly, that was long ago! It had been up all summer and had just loosened up and I’d never fixed her… poor thing. That post did have an awfully cute photo of me though! 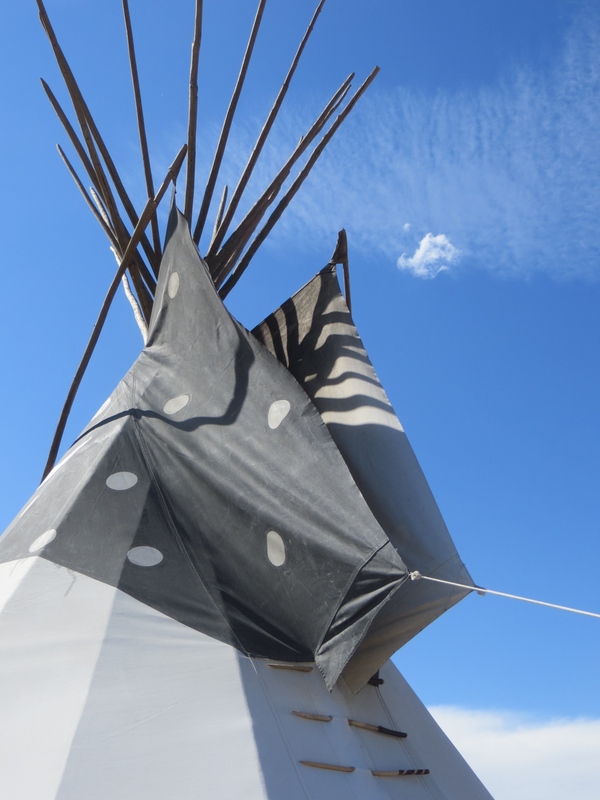 Judy asked: I’m very impressed with the tipis. Perhaps I’ve missed some posts. Is this on your land? 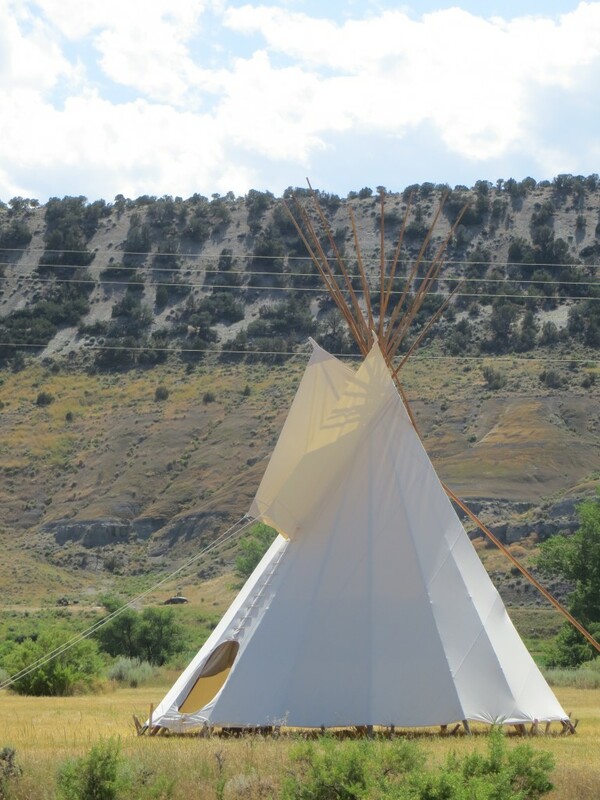 No, this is my sister’s tipi and it’s on her place down the road. Will you leave it up year round? No, canvas and moisture/snow don’t usually make a good mix. This will come down in the fall. Did you make the poles yourself? The poles are lodgepole pine, what else??? 😉 My sister harvested them somewhere along the way and peeled and sanded them. The new unpainted tipi was sold with poles included. 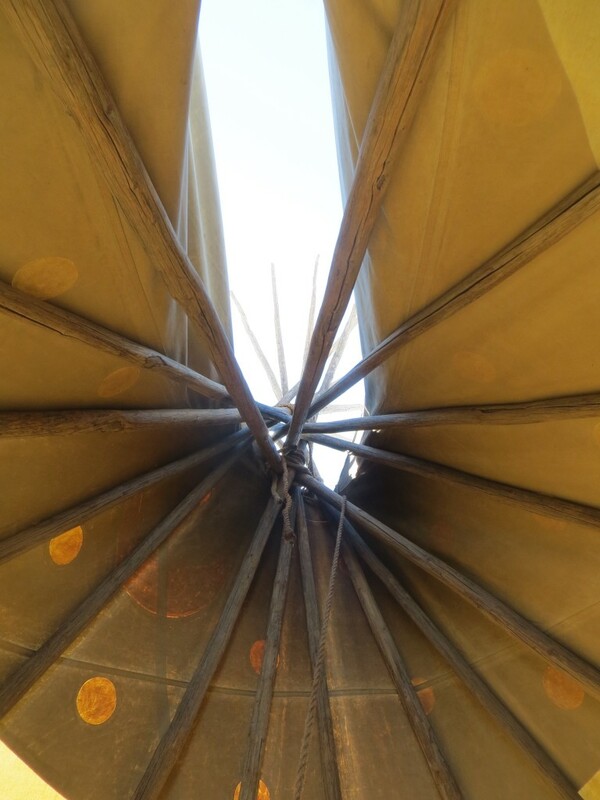 I have to go get new poles before I can set up my tipis… What is the covering made of and where do you get it? The covering is canvas. 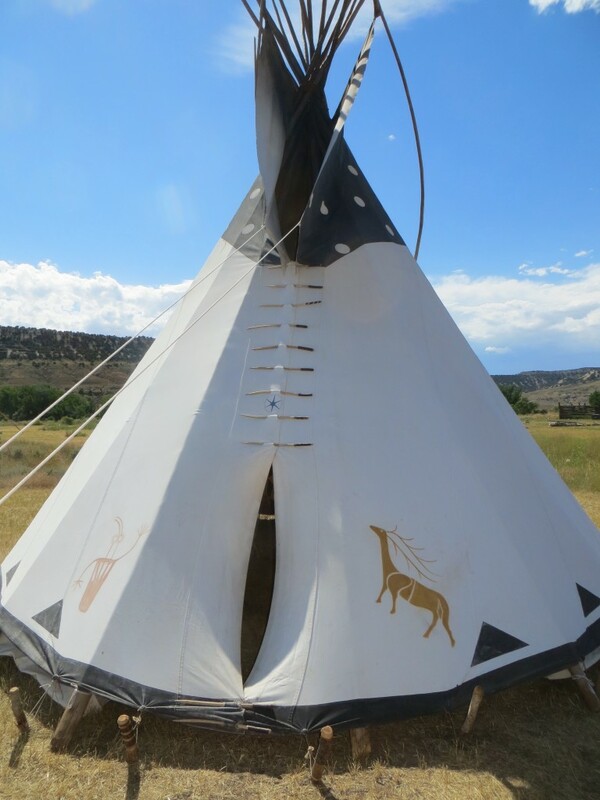 Tipi companies are out there… Mine and the painted one of my sister’s is from Blue Star Tipis. (they are out of business, I think) The other is a Reese Tipi. Sorry, this sounds more like an interrogation but I love it and can’t believe setting one up is as easy as your picks make it look. Sometimes it’s not very easy… practice makes for speed, so do cheat sheets with measurements from the time it went up great! Since we really don’t move ours often, it’s a memory game! Great job ladies! thanks! Kris said: Do you leave that little gap at the bottom for air circulation in the summer? Yes, it’s all about air circulation! Even in winter! That air rising between the tipi and the liner is what lifts your smoke out the top. Otherwise, you’re just sleeping in an open chimney! And is the rope tied down in the middle? I can’t tell if there is just a hand-hold at the end, and it just reaches the ground, or if it’s staked down. Yes, it is staked down. It is what holds your tipi in place in the Wyoming wind. Here, let me add some pics. This should help! Here’s the front door on Dee’s painted tipi. A door can hang over the opening on the outside if you want, and the liner can close it from the inside. You don’t knock, you scratch the canvas for permission to enter. The pins above the door are what holds the tipi together. Step through the door and you see this. There’s the painted liner, two “chairs” or back supports, the rope from the poles tied off to a stake in the ground, and little Ace! FYI, she doesn’t have it all set up, she has blankets and beds and tons of stuff in it once it’s all done. Look up and you see this. The smoke hole and poles! 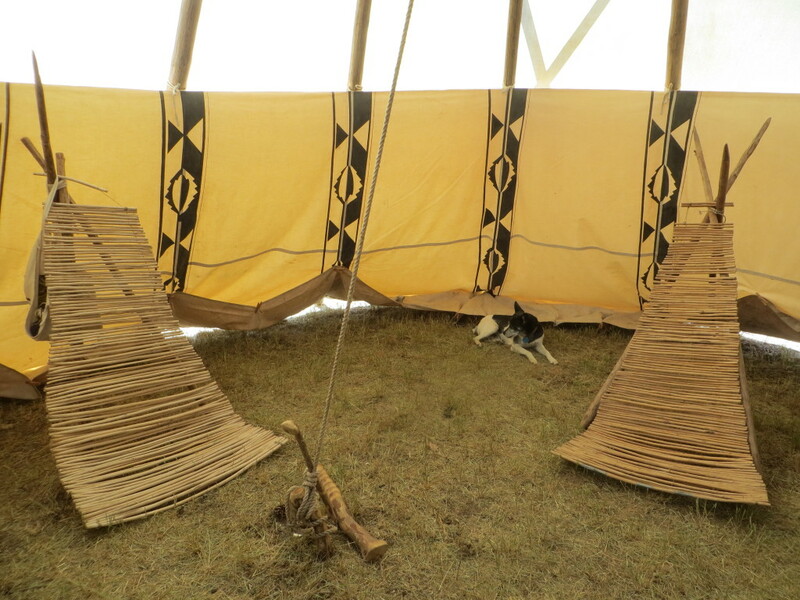 Actually, in winter, if you’d like to keep more heat in, you can even tie on an “ozan”, which is like a half ceiling to slow down the escape of warmth, though tipis can get warm pretty fast with a fire and people inside. If you lift the liner up, you can direct more breeze, cooler air, or more ventilation along with adjusting the exterior smoke flaps. It’s amazing how much dirt and dead grass the liner catches… Wyoming does have wind, you know? Exterior smoke flaps can also be closed to keep heat in or rain out… just move the poles. The “new” tipi is a Reese tipi. Made a bit differently, Dee fought and fought to get those upper wrinkles out, but gave up… for now! Note the different door style. 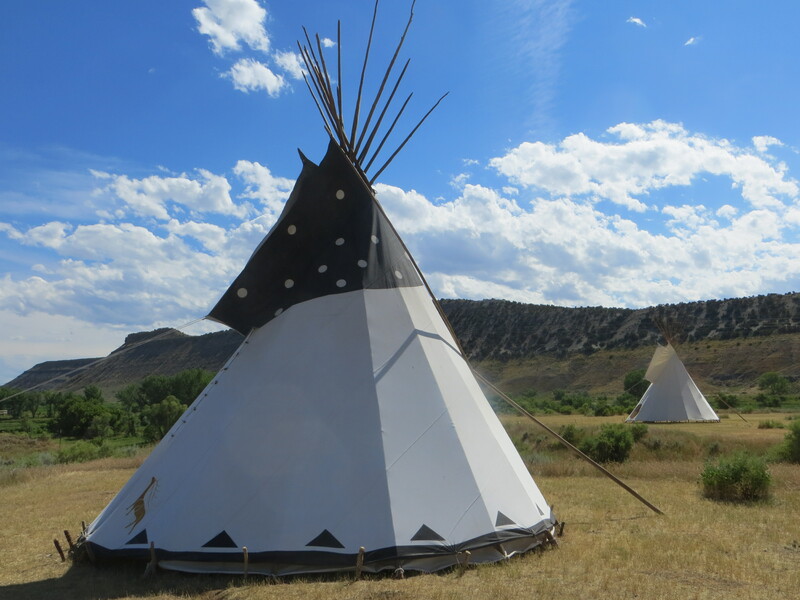 Judy asked: I did wonder why you put up the Tipi… Well, because we can? 😉 We are card carrying Choctaws but grew up in Wyoming… Dee got married in her tipi way back when… We’ve always been attracted to them since our parents made us one when we were little! I love sleeping in my tipi or just under the stars, and it is just a great place to BE. Dee is ready to go get me some tipi poles so we can have a village of four, so for those of you who want to be our sister… I think we have room! THANKS for featuring the tipi again!!! I loved the post in 2008, and went back to read it again. On my recent trip to Calgary, I learned about lodge-pole pines (and saw them, of course) plus another name for the flaps at the top of the tipi: ears!!!! How ’bout that!! You and your sister are amazing. And I think tipis are really beautiful. What an adventure for you and your sister. I’ve learnt so much about tipis. Thanks for the great photos. Hope you are able to sleep out in the tipis soon. The night sky must be sooooooooo amazing with no light pollution.